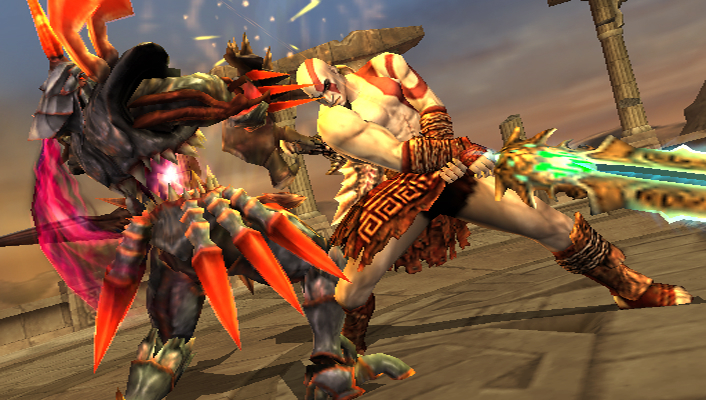 Kratos smashes his way into NamcoBandai's impressive portable fighting game. Ten years after its debut on the Sega Dreamcast, Namco's SoulCalibur series finally come to PSP. Broken Destiny is the latest addition, and while it doesn't do anything significantly different from last year's SoulCalibur IV, it's still a highly recommended portable fighting game, lame d-pad notwithstanding. All 28 fighters are unlocked from the start, from smaller, more agile warriors like the mysterious Taki to the larger, devastating opponents like Nightmare. In addition, two new opponents join the cast. Dampierre is a cocky dude in a top hat with twin daggers embedded into his sleeves, as he stabs you quickly and then laughs about it while tickling his handle bar mustache. He's OK, but players should definitely go with Kratos. Yes, the star of Sony's God of War series is in full force, knocking opponents to the ground with his signature chain blades and other God-like moves. If you're not satisfied with the roster, you'll be happy to know that the create-a-fighter mode, which made its debut in SoulCalibur IV, is included. So now you can make your own dream warrior, be it a girl with cat ears and a deadly hula-hoop or a yuppie that beats up people with a vengeance. To keep things interesting, the developers added Gauntlet Mode, where you'll work through a series of tutorial-style missions. They're helpful when it comes to learning your character's moves, but they come up empty in regards to story. There's also Quick Match mode, where you take on numerous computer opponents, along with numerous Attack, Defense and Trial challenges. Find a fellow PSP owner who also has a copy of the game and take them on in versus mode. The action moves very smoothly over AdHoc, although we wonder why Namco Bandai didn't include support for Infrastructure. Think of the competition we could've found online. Despite the weak d-pad, the game sports excellent fighting controls. You'll have no problem figuring out grabs, perfecting your escape moves and setting up counters. There are some characters that have more power than others (you didn't really think Kratos would be a pushover, did you? ), but once you get used to everyone, you'll be fine. Broken Destiny's graphics look very good. The game retains most (if not all) of its speed, and the animation is smooth, right down to the jumping strikes and Critical Finishes. The backdrops are amazing too, and some of them are destructible with your weapons. (That leaves the door wide open for a quick "ring out" victory.) The menus are rather plain, but at least you can skip through them quickly. As for sound, you'll love it, especially if you have headphones. The music in Broken Destiny is awesome, with symphonic scores playing in the background while you dish out damage. The voicework is excellent, especially Kratos, with his Spartan taunts and his "won't back down" attitude. While it would've been nice to have a deeper single-player mode and more characters to go alongside Kratos and Dompierre, SoulCalibur: Broken Destiny is a terrific portable fighter. The controls are excellent, the create-a-player and versus options will keep you entertained and the presentation won't let you down. Yup, the Soul still burns. What's Hot: Kratos is an incredible addition, gameplay feels right at home, excellent presentation, a whole lot of unlockables, AdHoc versus play is fun, create-a-fighter still rocks. What's Not: Gauntlet story mode is lame and disjointed, Dampierre's annoying lines, you can't play online.